The Kodiak Management Area for the Division of Sportfish includes all waters of the Kodiak Island Archipelago, the Alaska Peninsula south of a line from Cape Douglas to Cape Menshikof, and the Aleutian Islands. This management area is subdivided into two regulatory regions: the Kodiak Regulatory Area and the Alaska Peninsula/Aleutian Islands Regulatory Area. Most sport fisheries are remote and, in some cases, can be relatively difficult to access with the exception of the road accessible streams located in Kodiak, Cold Bay, and Dutch Harbor. A coastal climate with high precipitation and relatively cool temperatures characterize much of this part of Alaska. The Kodiak Archipelago is a group of islands, south of the main land mass of the state of Alaska about 252 miles south of Anchorage in the Gulf of Alaska. The largest island in the archipelago is Kodiak Island, which is the second largest island in the United States. In addition to the community of Kodiak there are 6 remote villages. The Alaska Peninsula extends about 497 miles to the southwest from the mainland of Alaska and ends in the Aleutian Islands. The peninsula separates the Gulf of Alaska from the Bering Sea. The Aleutian Islands are a chain of both large and small volcanic islands belonging to both the United States and Russia. They extend about 1,200 miles westward from the Alaska Peninsula in the Northern Pacific Ocean. 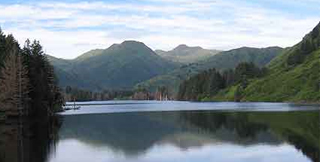 Principal public land managers in the Kodiak Management Area include the U.S. Fish and Wildlife Service, the National Park Service, and Alaska State Parks. Additionally, in some areas relatively large land tracts surrounding popular sport fishing destinations are owned by native corporations. Kodiak, with a population of approximately 11,000, and Dutch Harbor/Unalaska, approximate population of 4,300, are the two largest communities, although the area also includes villages with year-round inhabitants. Sport fisheries management and research functions are based in the Kodiak area office.